Mr. Angel Gurría, Secretary-General of the OECD, was in Lima from 7 to 10 October 2015 to attend the World Bank / International Monetary Fund Annual Meetings. The Secretary-General delivered two major reports in Lima: the final package of the OECD/G20 BEPS Project, during his participation at the G20 Finance Ministers and Central Bank Governors meeting; and the OECD report on progress on climate finance, to participants at the Climate Finance Ministerial taking place ahead of the COP21 Paris meeting. The visit to Lima also had a very strong bilateral component to signal the growing collaboration between Peru and the OECD. The Secretary-General met with President Humala and various members of his government, and presented an OECD Multidimensional Country Review of Peru (read the Secretary-General's remarks in Spanish). On the occasion of his visit, Peru also solicited its adherence to the OECD Green Growth Declaration, at a ceremony taking place at the Presidential Palace. During his stay in Lima, Mr. Gurría participated in various other events, including the Deauville Partnership Finance Meeting. He also held several bilateral meetings with participants at the annual meetings. 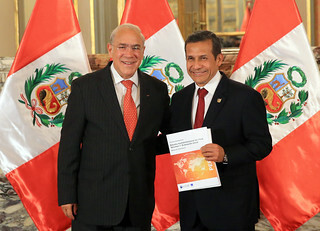 8 October 2015 - OECD Secretary-General Angel Gurría presented the Multi-Dimensional Country Review of Peru to Peruvian President Ollanta Humala. The Secretary-General and the President also discussed the progress in the implementation of the OECD Country Programme with Peru, launched in December 2014. Lima, Peru.